Jean pressed “play” and the vintage CD stereo begin soft sounds of “Make it with you.” She took his hand. He pulled her close. They danced. He still thought the band Bread was awful but after all, it’s the things you do for love that count. I wrote this for the Rochelle Wisoff-Fields photo writing challenge. The idea is to use the image above as a prompt to write a piece of flash fiction no more than 100 words long. After a lot of editing, I got my submission down to 100. I admit that I found the photo far too schmaltzy for my tastes, but while I was cooking breakfast, I had an epiphany. 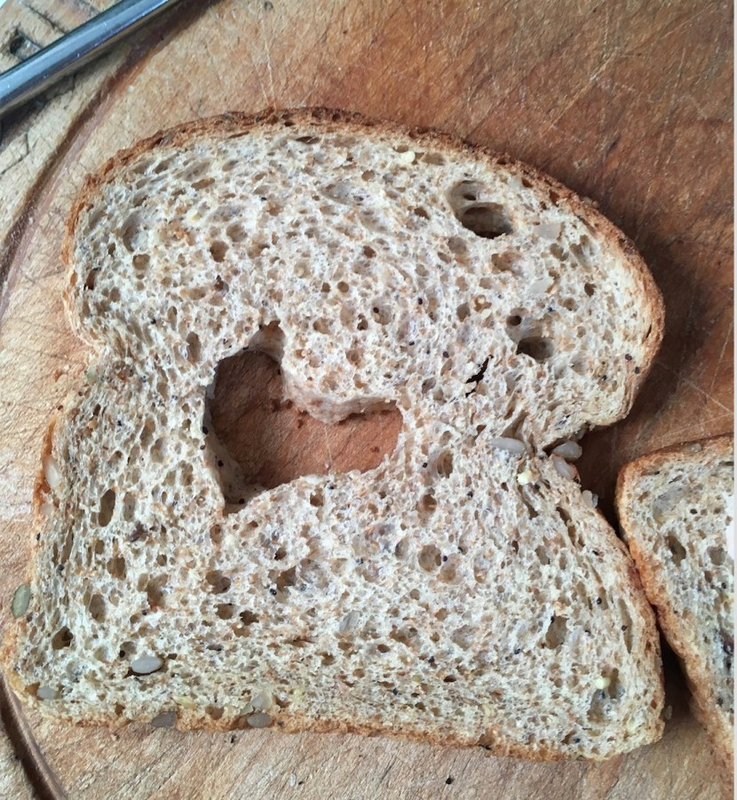 Yes, I too can’t stand that 1970s band, but a piece of bread with a heart cut out in the center seems to describe them perfectly. Oh, in 1973, their hit album really was The Best of Bread and the lead track on side one was Make It with You. Not that familiar with the band, but I like were the prompt took you with them. They were popular in America between 1970 and 1977 so it’s no wonder you haven’t heard about them. I don’t even hear them anymore on “oldies” radio stations. Thanks. Good story James. An added bonus is the way you (accidentally?) worked in the title of a song by another 70s band, 10cc, i.e. “The things we do for love”. That was totally unintentional…uh…ahem…yeah, I meant to do that. 😉 Thanks. I noticed that, too. uh…ahem… good job, James. Now I have an earworm. 😉 Sweet story. An earworm? You might want to have that looked at, Rochelle. Thanks. Sounds like a amorous evening, almost took me back to flower power, and balsamic dressings. Yeah, people our age are going to relate to this more than the younger folks. It’s true, you seldom hear Bread on the radio. Not all bad then. Such a heartwarming story . Beautiful! Good use of the song in the prompt. Not familiar to me, but it doesn’t matter. The meaning is what matters. That’s okay. Bread had their moment in the Sun and mercifully, they are now part of pop music history. Ha! And you ended with the song from another band and a good sentiment. That was accidental, but you’re not the first one to point that out, Sascha. Thanks. The band Bread was active for most of the 1970s so if you are fairly young, you probably never would have heard their music. You can Google them if you’re curious. Thanks. like the sentiment portrayed in the story. it’s heartwarming and uplifting at the same time. well done. I’m mortified to admit they were one of my early favorites. Now I don’t own a single mp3 of them. It’s okay to have liked them and to still like them. Heck, I used to listen to the Carpenters, though now I think their music would drive me nuts. Well, let’s just say my taste in music has changed over the years, Dale. Of course… though I have to admit there is not much that I liked before that I don’t still! I used to love John Denver’s music, but not I have zero interest. Still like Elton John, though. I tire very easily. Now my regular playlist has nearly a thousand songs, and ranges from Indonesian native music to Hurt. It does jar a bit when I go straight from hard rock to old time blues, but I need the diversity. It’s hard for me to listen to music anyplace except the car. If I’m writing, it has to be instrumental because lyrics scramble my brain when I’m trying to write words. When I write, I tend to listen to jazz, maybe a little classical. In the car, it’s rock and pop mainly. Well, different strokes, and all. I’m sure I listened to it at the time, but whenever I hear some of those old 1970s songs now…well, let’s just say I discover that some of my taste in music has changed over the years. A nice, well-written story. I like the way you open in the middle of the discussion – that works well. Thanks, Penny. With only a 100 words to work with, I have to choose my “moment” carefully”. ‘If a picture paints a thousand words then why can’t I paint you?’ I suddenly have Bread songs filling my head and I’m loving it! Glad you do, Keith. By the way, your comments here almost always end up in the spam bucket for some reason. Fortunately I look before emptying it. Also, is there any way to adjust your own anti-spam settings on blogger? Those “how many squares show a street sign” images aren’t always easy for my old eyes to figure out. Thanks. This is so warm and loving, great story. I never heard of the band, but it’s on Youtube. Not my kind of music either. LOL. She listens through the ears of nostalgia. Ha this was a great take on the prompt and made me laugh. hey – I really like the Bread band – wow – enjoying them on YouTube right now…. Ha! I’ve created a new fan for the band. Well, I can’t argue with that part. That’s the cutest thing I have read. Your last line is epic.